Help : Contact binnall if you have any technical problems. As always, feedback on the interviews is appreciated. 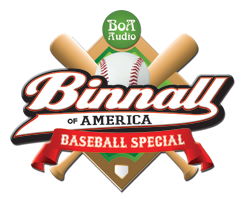 BoA:Audio celebrates the start of another baseball season with our massive 2015 Baseball Special featuring a whopping seven different guests. Amongst the cavalcade of paranormal personalities joining us for this year's festivities are crackpot historian Adam Gorightly, Radio Misterioso host Greg Bishop, legendary cryptozoologist Loren Coleman, author Jason Offutt, redsonsuperman of theusofe.com and Lostcast fame, filmmaker and paranormal pundit Paul Kimball, and, making his baseball special debut, radio and TV host Richard Syrett. Over the course of this marathon episode of the program, which clocks in at nearly the length of the average baseball game, we cover each guest's respective hometown team and how they may fare in 2015 as well as the latest developments from the world of baseball over the offseason. Plus, of course, the always competitive and hotly contested annual prediction contest where our guests vie for the crown of 2015 Baseball Special champion. Recap: Leading off this year's festivities is the illustrious Adam Gorightly, who kicks things off by basking in the San Francisco Giants' third World Series title in the last five years. Adam also gives us the lowdown of Madison Bumgarner, who was magical for the Giants in October. This leads to some confused talk about Clayton Kershaw of the Dodgers and then Gorightly gives Binnall the inside scoop on 'Kung Fu Panda' Pablo Sandoval, who left the Giants to go to the Red Sox this off season. Given Adam's post-World Series experience the previous two times around, we find out if he expects the Giants to experience a post-championship hangover. Since Adam is a denizen of the NL West, we get his take on the off season moves of the San Diego Padres. After being disconnected by some alliance of the NWO and BBWA, we resume the segment by awarding Adam yet another Silver Slugger award for the third Giants World Series, unveil the big 2015 prediction contest twist which Adam finds repulsive but logical, and we get his much-anticipated 2015 predictions. Batting second on this year's special Greg Bishop, host of Radio Misterioso and record holder for most BoA:Audio appearances. We kick things off by finding out the state of Greg's Los Angeles Dodgers heading into 2015, beginning with us getting some clarification on the playoff struggles of Dodgers' ace Clayton Kershaw. We then talk about the Dodgers' off season, which included getting a new GM and making a bunch of trades. We end up talking about Spring Training, Greg's baseball plans for 2015, and his thoughts on all the crazy moves that the San Diego Padres made. Following that, we get Greg's take on the new pace of play rules that have been implemented this season and we talk about how trying to appeal to non-fans seems like a foolish tactic for MLB. We then dive into predictions and get Greg's picks heading into 2015. And we wrap up the segment with an update on what's next for Greg Bishop, which leads to an extra ten minutes of us just chatting about podcasting, ufology, and other fun stuff like that. Our next guest, making his long overdue return to the baseball special, is legendary cryptozoologist and ardent Boston Red Sox fan Loren Coleman. We begin by getting Loren's initial feelings on the Red Sox heading into the 2015 season and how he feels the team will perform. We then get Loren's take on the Red Sox' failed attempt to bring Jon Lester back to the team during the offseason and if it was more public relations than a genuine attempt. Given that Loren watched the early development of Hanley Ramirez in Boston's minor league system, we find out what he thinks of Hanley returning to the Sox after all these years. This leads to some talk about the influx of Cuban players in major league baseball and if Loren thinks the diplomatic changes will result in more Cuban players coming to the United States. We move on to reflect on the Red Sox pitching rotation going into 2015 and whether or not it will be enough for the team to contend. Since Loren has detailed thoughts on all of his predictions and the various divisions, we dive right into predictions and get his forecast for 2015. Throughout predictions, we get Loren's take on the troubles of Josh Hamilton from the off season as well as the new MLB commissioner. Wrapping up the segment, we find out what's next for Loren Coleman in 2015 and beyond, including the International Cryptozoology Museum Conference to be held in St. Augustine, Florida in January of 2016. Batting clean up on this year's special is one of the co-holders of the 2014 championship and longtime KC Royals fan Jason Offutt. We kick things off by having Jason reflect on the amazing, unbelievable, and magical run of the Kansas City Royals this past October. We also get Jason's take on the final moments of game seven of the World Series and the ensuing debate afterwards. Jason then details some of the big off season departures from the Royals, get his prognosis for how 2015 may shape up for the team, and find out if he thinks they'll have a World Series hangover. Continuing a theme of the special this year, we get Jason's stance on baseball trying to speed up the game, which leads to us talking about how baseball can't really compete with more violent sports. After all that musing, we then get Jason's official predictions for the 2015 baseball season. Our fifth participant on this year's special is our proverbial AAA prospect turned All Star, redsonsuperman, one of the co-holders of the 2014 championship. We begin by getting RSS' prognosis for the Detroit Tigers, his hometown team, going into 2015 and whether or not the window of opportunity is beginning to close for the team. We then get RSS's take on Binnall's most hated player, David Price, and we find out if redsonsuperman thinks he'll stay in Detroit after 2015. Since Rick Porcello came to Boston from Detroit, we get RSS's insights into what to expect from him pitching for the Red Sox. As RSS is a denizen of the AL Central, we find out what he thinks of the Kansas City Royals and their magical postseason run. Next he shares his hopes for Alex Rodriguez in 2015 and gives Binnall grief with some then-breaking news that the Red Sox sent their prized Cuban outfielder Rusney Castillo to the minors before the start of the season. Wrapping up the segment, we get RSS's predictions for 2015 and, for the first time in baseball special history, RSS actually has something to plug. In the six spot, we bring aboard filmmaker, paranormal pundit, and veteran Baseball Special guest, Paul Kimball, who starts things out by giving us an update on what he's been up to since we last hear from him, which was, stunningly, last year's baseball special. We then dive into the baseball with Paul bidding farewell to Budd Selig as the commissioner of baseball and sharing his thoughts on his legacy. This segues to Paul talking about the World Series and the Madison Bumgarner v. Clayton Kershaw debate. We then get our annual Blue Jays forecast from the reluctant Toronto correspondent. Given that Paul is a displaced Red Sox fan, we also get his annual forecast for the team and how he feels about the Sox going into 2015. We also get pace of play thoughts from PK as our resident baseball purist. Nearing the end of the segment, Paul gives us his predictions for 2015 along with the usual side tangents, including the murky future of the Tampa Bay Rays. Wrapping up the segment, we find out what's next for Paul Kimball in 2015, including an appearance at the East Coast ParaCon in Nova Scotia this August. Closing out the program, we welcome the host of The Conspiracy Show, Richard Syrett, who makes his return to BoA:Audio and his first-ever appearance on the baseball special. Richard begins the segment with a riddle and then, as a resident of Toronto, Canada, he gives us his forecast for the Blue Jays heading into 2015. Richard marvels at the plethora of rookies who will be starting for the Blue Jays this year and we also get his thoughts on the blockbuster trade which brought Josh Donaldson to Toronto and sent Brett Lawrie to Oakland. In what might be a first, we then discuss the drawbacks of Toronto's home ball park having artificial turf and how that may be a deterrent in attracting free agents. Speaking of trades and top free agents, we get Richard's opinion, in retrospect, on the big acquisition spree that Toronto had a few years ago which brought Jose Reyes, Mark Buehrle, and R.A. Dickey to the Blue Jays. We also talk about the big addition from this past offseason: catcher Russell Martin. Wrapping up Richard's segment, he throws his hat into the ring for the prediction contest and tells us about his Follow the Truth 2 event to be held in Oshawa, Canada at the end of April.